This examination considers the influence of the seventeenth century Cambridge Platonist Cudworth upon the thought of the late eighteenth century German thinker Herder. 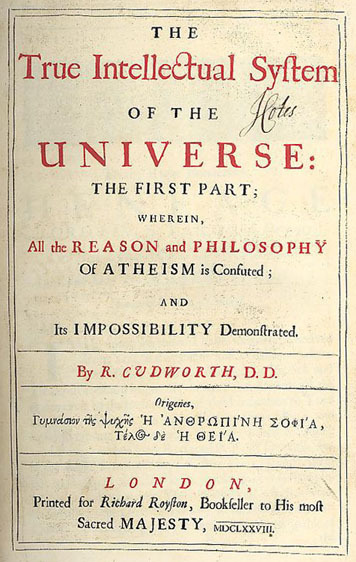 It focuses upon Herder’s use of Cudworth’s philosophy to create a revised version of Spinoza’s metaphysics. Both Cudworth and Herder were concerned with the problem of determinism. Cudworth outlined a number of difficulties relating to this problem in the thought of Spinoza and proposed amendments, particularly the introduction of the middle principle of plastik, which would mediate between the Ideas of transcendent reason and mechanical materialism. We find these amendments to Spinoza’s philosophy also employed in Herder’s contribution to the Pantheism Controversy, in which he too offers a revised Spinozism and introduces his own middle principle of Kraft. This demonstrates an important but under-explored English contribution to a key development in German intellectual history. The Pantheism Controversy was an epoch-making event, helping to bring an end to the German Enlightenment and to inaugurate the Romantic movement. Herder’s version of Spinoza’s thought revived the philosopher’s fortunes, and Herder’s notion of Kraft became central to Romantic aesthetics. Finally, Herder’s use of Cudworth demonstrates the important but overlooked source of Platonic realism in German Romantic thought.